I don’t talk too much about my personal life on here and that’s for a few reasons. First, I’m not one for letting everyone know everything about my everyday life, and second, I don’t think I’m that interesting. But, I recently started my senior year of college this week and it’s been interesting. I’m ready to get my undergrad degree and step into the next phase of my life. Like most humans though, sometimes I hate life. The other day I was in a Political Science class where I was supposed to be writing code for a data set or something and what was I doing instead? Watching the Black Panther trailer. It was nice to get away for that minute and a half. Everyone needs that sometimes. I’ve never been one to think of comics as true escapism. I think people only bring that up when comics talk about something they disagree with (race, feminism, etc.) But it is nice to read a comic that has nothing to do with what you’re dealing with in the real world. Sometimes, at least for me, it can give you the clarity you needed or that reset you needed to keep going. Diving into the astral plane with Logan in this issue of Astonishing X-Men was the prefect amount of escape for me this week. A small recap of this story. It’s being written by one of my favorites in the industry, Charles Soule. He’s writing the current Daredevil and Darth Vader comics in Marvel as well. Soule is a writer who respects whatever property he’s dealing with while being able to add a new flavor to the property. Astonishing X-Men seems to be another step in that direction. This story is about a random team’s encounter with the villain known as the Shadow King. He’s a powerful psychic that’s attempting to escape from the astral plane. To do this, he’s been targeting psychics around the world. Actually, he’s been killing psychics because he sees them as weak. He eventually gets his hands on Psylocke, one of the most powerful psychics in the Marvel Universe. The Shadow King attempts to infiltrate her brain and a bug manifestation appears from her brain and begins to attack London. She calls out to anyone who will hear her. The ones who hear her are Old Man Logan, Rogue, Fantomex, Gambit, Angel, and Bishop. They arrive, help her get rid of the beast, and then travel to the astral plane to fight the Shadow King. While in the astral plane, it’s revealed that Professor X is alive and is playing a game with the Shadow King. The game is to see who can control the X-Men. If the Shadow King wins, he will control their bodies and be able to escape. Professor X’s motivations are still unclear here to me. The last issue ended with the group splitting up. Three doors were set up. One for Rogue and Gambit, another for Fantomex and Mystique (who disguised herself as Beast in the first two issues,) and the last door was for Logan. Bishop, Angel, and Psylocke stayed in London. This issue focuses on Old Man Logan and his struggle in the astral plane. If he succumbs to the illusions, his mind will be lost forever. The artists on this series have been rotating every issue. The first two looked great to me. This one was okay compared to those two, but overall it wasn’t bad. Ed McGuinness was the penciler, Mark Morales the Inker, and Jason Keith the color artist. The reason I mentioned that pointless bit about my life at the beginning of this review was because this issue started off perfectly. It starts with the words, “Imagine this.” Yes, that’s a simple, straightforward phrase, but it helped me focus on the story that was in front of me. That’s why I love the X-Men. Their comics and their world are able to teleport my mind away from it all. We see narration from someone as Logan travels through the astral plane alone. The narration talks about Logan’s life up until this point. For those who don’t know, the real Wolverine is dead. 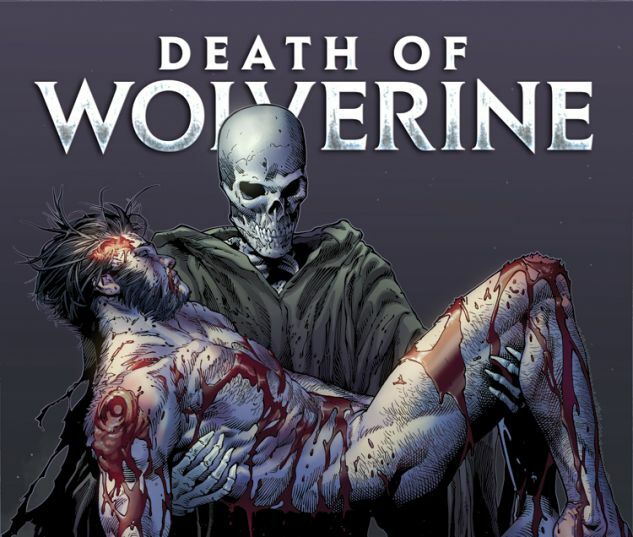 The Death of Wolverine, also written by Soule, was an emotional end for Wolverine, but now, he’s back. Somewhat. This version is from the Old Man Logan storyline, written by Mark Millar. In that story, Logan accidentally killed everyone he was close to. He lived in a desolate wasteland in the future that was overrun with villains. Now, he’s traveled to this universe and is on the X-Men again. The narration is powerful because it talks about Logan not fitting in with this timelines X-Men. They accept him, they call him a Wolverine, but in his heart, he knows there’s too much blood on his hands. A perfect way to open this story. Back in the physical world, Bishop, Psylocke, and Angel are dealing with the military. They want answers from the mutants. Psylocke’s beast was short-lived, but instead of leaving the scene, she insisted the rest of team go to the astral plane right away. A helicopter approaches them and tells them to leave the scene and that any aggressive action will be met with lethal force. Angel flies up to the helicopter and tries to reason with the military. I liked this scene because as I said in the review for the first issue, this part of the story shouldn’t just be left alone. I wanted to see the consequences of Psylocke’s accident and we’re seeing it unfold. Logan continues to fight in the astral plane. Illusion after illusion comes at him until Professor X appears in front of him. Professor X was killed by Cyclops when Cyclops became corrupted by the Phoenix Force. I have no problem with him coming back into the mainstream. He tells Logan they don’t have much time and that he needs Logan’s help. Logan thinks it’s another illusion and walks past him. Professor X assures him that he is real and that Logan needs to listen to him. Flash back to the real world and Angel has a scare with his “blue self.” The military personnel continue to antagonize the ground team. A piece of a net hits Angel and he almost turns into the powerful Archangel. He’s able to control himself though and explains the situation to the soldiers before they fire again. Back to the astral plane, and Professor X tells Logan that the others are succumbing to the illusions. He’s the only one who’s strong enough to fight them off. Logan doesn’t care about anything the Professor has to say. He starts to walk away when a fight breaks out between the two. Professor X takes the shape of a warrior that looks like a Samurai. The last part of this issue confused me. As I said earlier, I have no idea what the Professor’s intentions are. The Shadow King thinks that Logan is fighting an illusion with Mr. Sinister, when in reality the battle with Professor X raged on. It appears as if Logan succumbs to the illusion and the Shadow King claims him. Professor X doesn’t seem to care. The last words he says are, “He’s not my Logan.” The last pages of the issue throw us back to the physical world. A soldier is on the ground with the other mutants. It seems as if everything is going to work itself out when a possessed Logan rises up and stabs the soldier through the chest. Does the Shadow King have possession? Does Professor X have possession? Who’s in control here and how are the other X-Men doing in the astral plane? This story is fun and exciting. The first three issues have set up the story brilliantly. There are a lot of ways that this story could go. I imagine we’re going to see what the others are up to in the astral plane next. But, what is Professor X’s endgame. He’s known to be a sneaky man and ruthless when he’s trying to get what he wants. Does he want to come back to life to help his students? Does he have a vendetta against them? And how will the real world respond to Logan stabbing that man at the end? The best stories have multiple angles and this story has the perfect amount. Wherever Soule takes this is fine with me. I’m strapped in for the ride. I know I didn’t talk much about negatives in this comic, but that’s because I didn’t have much. The only noticeable thing was the art. I’m an easy man to please. Marvel, DC, Valiant, whatever, I like it all. Most of the comics these companies put out are good, just a matter of preference and what you enjoy. If something in a comic really bothers me, I’ll include it in these reviews, but nothing annoys me that much. I hope you enjoyed this review and remember to share this review and follow me @peacelovecomics on Twitter. Until next time!